Capital guaranteed and guaranteed yearly cash benefits awaits you while you save! Receive a guaranteed cash benefit of 6% of Face Value* yearly. *Face Value of this policy is the notional value used to determine the non-guaranteed bonuses and the guaranteed cash benefits. It is not the sum insured of your policy. The capital will be inclusive of total Guaranteed Yearly Cash Benefits paid. Enjoy a shorter premium period of just 5 years. A lump sum benefit consisting of a guaranteed and non-guaranteed amount will be paid out at the end of the policy term. Death protection offered throughout the policy term even while you receive your guaranteed yearly cash benefit. **This is based on the illustration that a male non-smoker, age 30, takes up the policy with a face value of S$35,000, annual premium of S$10,000 and reinvests the guaranteed yearly cash benefit with Etiqa. Jason (age next birthday 30, non-smoker) plans to set aside $10,000 annually to save for his mid-term goals. However, he wishes to remain flexible to enjoy occasional rewards or to deal with unexpected emergencies. He takes up an eSAVE flexi (5pay10) presto policy. When Jason reaches age 40, a lump sum will be ready for his mid-term goals. Jason receives his guaranteed yearly cash benefits from end of year 2. Jason reinvests his 8 guaranteed yearly cash benefits with Etiqa at a non-guaranteed interest of 3% per annum. * The above illustrated values use bonus rates assuming an illustrated investment rate of return of 4.75% per annum. Assuming an illustrated investment rate of return of 3.25% per annum, the total payout received from eSAVE flexi (5pay10) presto under Scenario 1 and 2 are S$55,070 and S$56,245 respectively. The two rates, 4.75% per annum and 3.25% per annum, are used purely for illustrative purposes and do not represent the upper and lower limits on the investment performance of the participating fund. 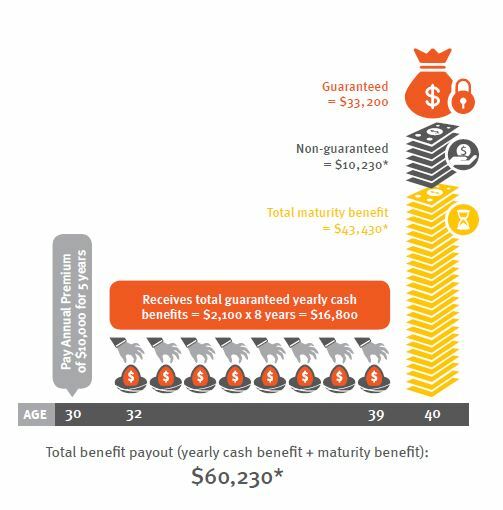 As the bonus rates are not guaranteed, the actual benefits payable will vary according to the future performance of the participating fund. Past performance or any forecasts are not necessarily indicative of the future or likely performance of your participating policy. Age means the age at next birthday. This product is covered under PPF Scheme. This content is for reference only and is not a contract of insurance. Full details of the policy terms and conditions can be found in the policy contract. Buying a life insurance policy is a long-term commitment. Early termination of the policy usually involves high costs and the surrender value (if any) may be less than the total premium paid. Information is correct as at 2 July 2018.